The pitter patter of little takahē feet is on the cards at Kahurangi National Park. 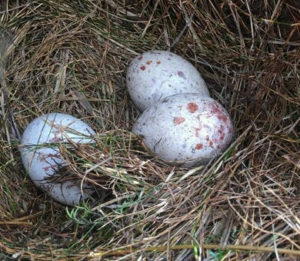 DOC reports that the first eggs of the new wild population have been found at Gouland Downs off the Heaphy Track, only the second wild site for takahē. Today it is exactly 70 years since takahē were rediscovered in the Murchison mountains of Fiordland. As a student, one of my holiday jobs was working at the Murrell Accomodation in Manapouri. Old man Murrell told me that he had been one of the group that lead Orbell up into the mountains on that day. He also laughed and claimed that they knew of the existence of the birds long before this. I wonder? Never-the-less, we mark today as the 70th year of their rediscovery. Takahē in Cloak of Protection belong in Tane’s Forest Realm. The work of The Takahē Recovery Programme means that they did not join Hine Nui Te Po in the realm of the extinct. Seventy years on they remain with us, and are now laying eggs in the wild in two locations.